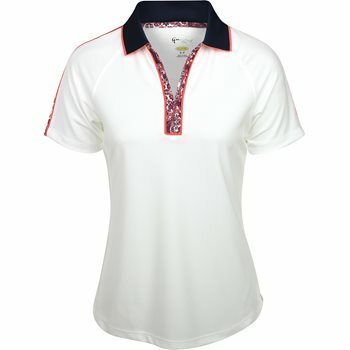 The Greg Norman Durham Zip polo is designed with a tipped knit collar, shirt tail hem, bandana print insets with coral sunrise piping, and a zip placket for closure adjustability. It features UV protection against harmful sunrays and Play Dry moisture wicking that draws sweat away from the skin to keep it dry when temperatures are high. The polo is made with polyester fabric that offers durability for machine washing and resistance against shrinking, mildew, and wrinkles.